Considered to be the birthplace of the Renaissance, Florence is a small city that enchants travelers with mesmerizing architecture and art. Unlike Rome, Florence offers a more vibrant and intimate experience of Tuscany. The fondest memories I have of Florence are the feeling of being stranded in the deep countryside. Florence is an urban city masked with a small-town feel. An escape from metropolitan congestion. If you are looking for leisure in Italy, travel to Florence. The city deploys this casual bravado of culture that is quite intoxicating as you wander across the various 15th century palazzi and narrow cobbled stone streets. The most iconic landmark in Florence is the Duomo, the neo-Gothic cathedral towers the cityscape. With white, pink, and green marble, the Duomo bell tower is a breathtaking Italian treasure one must see. 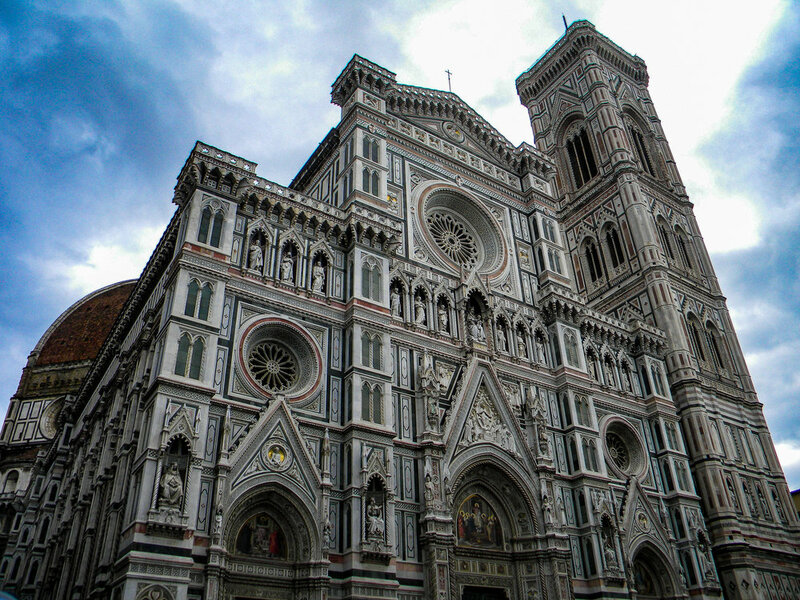 Since Florence is small, you will have time to visit all the medieval chapels, basilicas, and art museums. Florence shelters you with art. Museums like the Uffizi Gallery house paintings from the likes of Michelangelo and Botticelli. At the Piazza della Signoria, you will find sculptures and replicas of Michelangelo’s Statue of David, the Fountain of Neptune, Hercules, and Perseus holding the head of Medusa. These incredible white marble blocks cannot be overlooked. Although the city’s artistic temperament can be quite alluring, Florence ranks among Italy’s top food paradises. Italian cuisine is more than just pizza and pasta. In Florence you will be treated to gourmet meats. The Florentine T-bone steak is a Tuscan staple worthy of its reputation and price. Not a meat lover? Specialty dishes like Ribollita, a vegetable and bread soup are surprisingly delicious, filling, an affordable. Destinations like Rome, Venice, and Milan seduce people for its popularity and acclaim. Incredible as they all maybe, these cities have huge populations. Florence condenses that by allowing travelers to get lost in the ambience of Tuscany.